Western Animation / Hey Arnold! Hey Arnold! (1996-2004) is a children's animated TV series created by Craig Bartlett, the brother-in-law of Matt Groening (of The Simpsons and Futurama fame), and loosely based on a series of stop-motion shorts Barlett created. (The third one aired on Sesame Street.) The sixth cartoon from Nickelodeon's sprawling Nicktoons franchise, it starred an eclectic — and more often than not eccentric — group of characters that navigate a sort of urban wonderland. Arnold is a generally mellow 4th-grader with a head shaped like an American football, who lives with his paternal grandparents and their (also eccentric) tenants in a boarding house in the fictional in-universe city of Hillwood. Gerald is his best friend and "the Keeper of Urban Lore," who dispenses legendary tales of characters such as "Stoop Kid" (said to have been born on the stoop he can be seen, day or night, to glower from with promised vengeance to any who should think to violate his sacred site) or "Wheezin' Ed" (rumored to have a massive treasure cavern on the mysterious Elk Island). Also notable among Arnold's neighbors and classmates is Helga Pataki, a female bully who openly scoffs at Arnold's positive attitude while secretly having a massive crush on him. As the show developed, an increasing amount of focus was put on her extremely conflicted, melodramatic character and her utter obsession with the football-headed one - including her shrines dedicated to him. The show had a number of episodes dealing with the rather mundane aspects of childhood life, such as the crush on teacher episode, but also ventured into the surreal, such as Arnold and Gerald encountering the labyrinthine realm of the Sewer King to retrieve Arnold's grandfather's watch, and having to duel with him to avoid being declared his "royal rat groomers." In later seasons more attention was paid to the Love Triangle between Helga, Arnold, and Lila, the sickeningly sweet country girl who likes Arnold but does not like-him like him (much to Arnold's chagrin), Helga's transparently dysfunctional and unhappy family life, and the mystery of Arnold's missing parents. The show's production wrapped up in 2001, with a few remaining episodes airing until 2004. 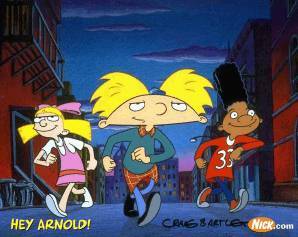 The final season was planned to end with a Made-for-TV Movie, Arnold Saves The Neighborhood, but received a Big Budget Beef-Up during production to repeat the success of The Rugrats Movie and was released theatrically in 2002 as Hey Arnold! The Movie. It was a financial and critical failure which resulted in the cancellation of "The Jungle Movie," a Grand Finale movie which was intended for theaters and would've given closure on the fate of Arnold's parents and his feelings towards Helga. Craig Barlett left Nickelodeon over contract disputes shortly thereafter while fans spent the next decade Sending Stuff to Save the Show. Those efforts eventually proved fruitful when, in 2015, Nickelodeon announced that they were putting The Jungle Movie put back into production as a two-hour TV film . It premiered in November two years later. Has an excellent Wiki here , as well as a Best Episode Crowner.